I have worked on a variety of projects encouraging community engagement with the arts. Such projects are always enriching and rewarding especially when I get the chance to work with groups who would not usually access arts activities. I relish being part of a creative team and can offer a wide range of skills as a collaborator, facilitator, maker and performer. I have worked on site specific theatre projects, intergenerational work, a neighbourhood lantern parade, community felt making, and public arts events. A site specific promenade performance exploring the moving history of the former chapel of Hill End psychiatric hospital, now Trestle Arts base (performer). A site specific community theatre/mixed media promenade performance resulting from a project exploring the long history of St Albans Town hall (devising team/performer). 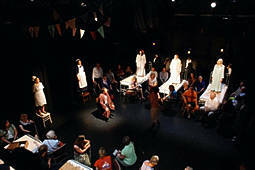 An intergenerational theatre project resulting in a large scale installation with performances (facilitator/designer/maker). Annual arts fun in St Albans parks (storytelling/puppetmaking/large-scale weaving/feltmaking). "I desperately wanted Kathryn as part of the artistic team on Spit and Polish, as I'd seen and been impressed by the extremely high standard of her work. She performed a crucial role in the show as a narrator/storyteller, but was also pivotal in the creating/devising process. Audiences adored her work, and I'd love to work with her again."